Maritime Photography by Søren Lund Hviid – I photograph, and I writes! This year it is 15 years ago, Destination Gotland received their two SF 1500 ferries from the Guangzhou Shipyard in China. For some reason, last weeks trip was the first time that I finally got to sail with them. 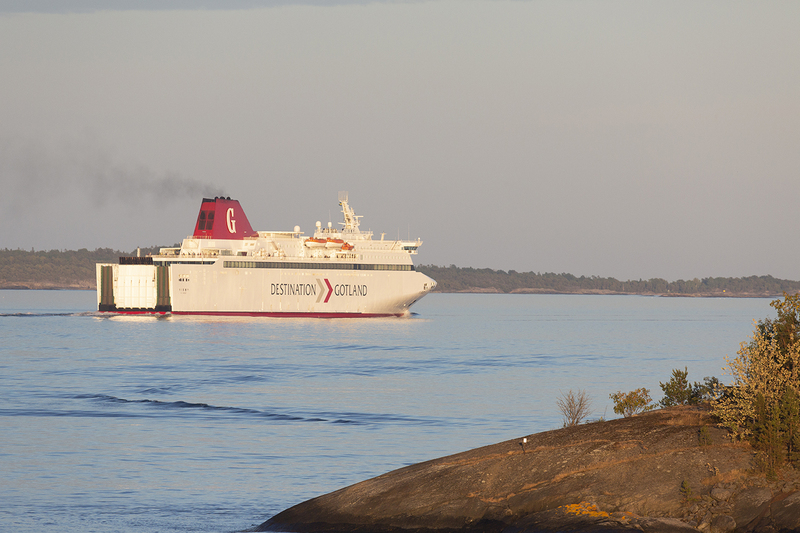 Normally, I am more responsive when significant newbuildings are delivered to North European operators, and especially if they are as beautiful and interesting as the pair to the state subsidized lifeline between Gotland and the Swedish mainland. GOTLAND alongside at Visby. Above: VISBY’s evening departure from Nynäshamn to Gotland. When I planned my recent photo trip to the Stockholm area back in the winter, it was my plan to try two generations of Destination Gotland’s fast conventional ro/pax ferries over a few days; VISBY or GOTLAND from 2003 and the first of two entirely new LNG-driven further developments of the SF 1500 concept, VISBORG. However, during the spring it was clear that VISBORG would not be able to reach the Baltic Sea from the builders for this year’s summer season. No angels are drawn by a coincidence. VISBY was almost entirely booked out on my journey last week. Therefore, I saw the concept when its capacity was fully utilized. However, helped by the great summer weather, which meant that many of my fellow passengers used the large attractive outdoor areas for the relief of passenger accommodation inside. It is always interesting to study an experienced operator’s proven and unique concept. I’m usually not a fan of a large use of fixed reclining seats on conventional ferries. But in the SF 1500 concept, it works well. The chairs are far better than those you see on, for example, most high-speed car and passenger catamarans. The location of life jackets between the individual seats instead of below them increases the distance to your neighbor and therefor also your privacy. At the same time there is plenty of legroom. The bridge and the forward part of the superstructure. Finally, there is also plenty of traditional seating in the catering area. On a full booked departure like mine, however, the catering area’s capacity seemed under-dimensioned. Though, most regular travelers, opposite to foreign tourists like myself, were well aware that it’s just a matter of waiting for lunch for about an hour and a half into the voyage, where the long queues were gone. In the beginning of the millennium, Guangzhou Shipyard, like other Chinese shipyards, had no experience in the construction of ferries and passenger ships to western customers. However, the SF 1500 project was developed by one of the world’s most experienced ferry designers, Danish Knud E. Hansen A/S. Maybe not to a surprise, I found the layout of the passenger areas, both the interior and the exterior, close to perfect. VISBY heads back to the mainland. At the same time, the SF 1500 is a typical example of the fact that Knud E. Hansen, in the clear majority of their projects, also takes the ships’ exterior appearance seriously. VISBY and GOTLAND are quite a beautiful pair of ro/pax ferries. Particularly the stem and the front part of the accommodation – and not least the beautiful minimalist, yet distinctive funnel. Here seabirds have provided a nice white foreground.